The events of the last few months can only be described as an economic perfect storm. Both junior companies and large conglomerates around the world went from planning their next multi-million (or billion) dollar expansion to putting projects on hold and cutting production, seemingly overnight. Focusing on core processes means aligning continuous improvement projects with the real business of the company. Whether it is mining diamonds, manufacturing clothes or creating reports, a company will likely gain the most returns by improving the process that brings in the dollars. In a manufacturing business, for example, processes such as accounting, marketing and legal add value, but their benefits usually are not seen on the bottom line immediately. Now may not be the time to optimize processes in these areas. 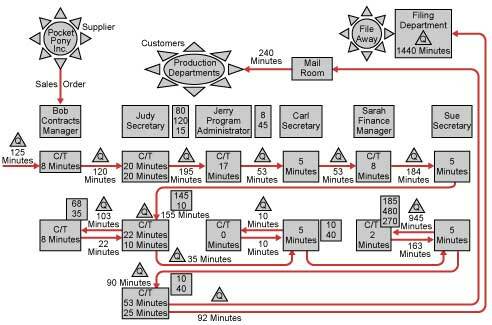 Value stream mapping (Figure 1) is an excellent tool to visualize the current flow of materials and information in the core process. The map can help identify bottlenecks, excess waste or missing information, signaling a range of improvement projects. Continuous improvement is a journey. The journey, however, can be accelerated. Companies need improvements now. Kaizen events and Lean tools are designed to make quick, small improvements that have immediate effect. Driving DMAIC and Design for Six Sigma (DFSS) projects faster is another strategy to accelerate continuous improvement. These projects tend to take more time compared to Lean or Kaizen exercises, but the gains are more substantial and have higher returns. By resetting priorities, roles and accountabilities, the benefits of Six Sigma projects can become more immediate. Managers and leaders must monitor project progress, eliminate roadblocks and provide resources to help practitioners complete their projects quickly. Creating a sense of urgency is vital in this volatile economy. A company culture that strives to meet deadlines, improve efficiencies and push continuous improvement will have an advantage over a company that reacts to problems or slowly improves. Having a compelling burning platform is only one component, however. Other components include being clear and precise about goals, setting specific completion dates and holding employees accountable. It is unlikely that a project can be completed without challenges. To keep up the sense of urgency, project progress must be monitored on a regular basis, not simply checked when a milestone date is reached. This monitoring can be done through a project-tracking template, which should show the list of current projects and their resources, plans versus actual status, dollars saved and the project’s link to the company’s strategy (Figure 2). Weekly or fortnightly project meetings need to be maintained; informal checks and “hallway discussions” are also valuable. Remember – what gets measured gets done. Creating urgency is not just a job for the project team and manager, however. Leaders must assist in resolving issues and eliminating roadblocks. This may involve freeing up resources, helping to push through change or approving capital. Leaders also must hold the project team accountable and give them feedback (both positive and negative). A company whose priorities, resources and leadership are focused on continuous improvement will find its improvement projects completed faster with better results. In current economic circumstances, companies that can decrease costs faster than their declining revenue will survive. Cutting costs takes time to implement. If the company knows that customers will be lowering supply orders in the next few months, now is the time to decrease costs. 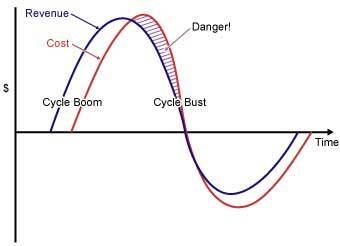 Do not wait until the customer’s order is cut back – this is when a company enters the danger area (Figure 3). Being in front of the curve, not behind, defines the intent of continuous improvement. Cost-reduction improvement projects must be done proactively and must be aligned with both the organization’s strategy and the needs of customers. The weighted criteria prioritization matrix (Figure 4) is an excellent tool to help select which projects need to be done first. Determining which projects to start requires thought and understanding, and is just as important as the project itself.